Symantec is reporting a sharp drop in the number of spam messages sent out since July, 2010 when 90% of all messages were spam. Today, they are recording only 73% as spam. Obviously it’s not time to throw away the spam filters, especially when your email address is on the Internet for business purposes. I use Spam Arrest and based on the statistics chart for my account this morning, I’m way above 90% spam in the past 30 days. 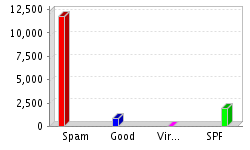 So, your spam results may vary. Check out what’s been done about spam and why the counts are falling.